KFC knows as Kentucky Fried Chicken is an American fast food restaurant which mainly deals in fried chicken. It has among the second largest chain in the world which includes countries like India, China, Indonesia, Japan, Mexico, Australia, New Zealand etc. It operates more than 350+ stores across India. You can have one of the delicious fried chicken at the best price online from KFC. It offers you deals like Triple Treat in which you can eat 4pcs Hot & Crispy, 4pcs Smoky Grilled and 6pcs Boneless Strips. You can choose from various chicken, burger, rice bowels, snacks and beverages online. If you will order a burger you can have choices like chicken zinger, veg zinger, 5 in 1 zinger box. KFC offers great deals on rice bowls which include Smoky Rice Bowl and Pepsi, Smoky Rice Bowl, 5 in 1 Rice Bowl, Veg Rice Bowl, Veg Rice Bowl and Pepsi. You can also choose from KFC snacks which have offers like 3pc boneless strips, 4pc hot wings, 2pc hot & crispy, 2pc smoky grilled, 4 veg strips, large popcorn and more. KFC also provide great offers on Wednesday in which you can have your favourite chicken at the cheapest rate. You can make use of TalkCharge coupon while booking on KFC. Activate offer link and order online from KFC website to earn cashback in TalkCharge wallet. 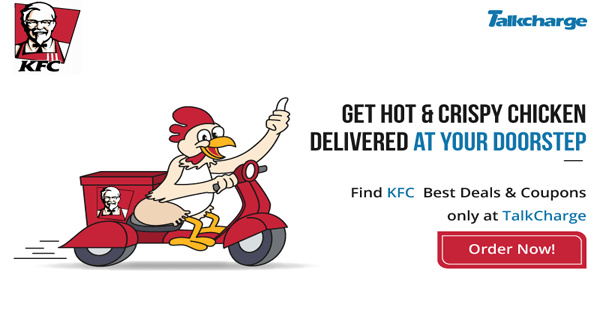 Just check out the latest deals and offers on KFC. If you are looking to have something delicious on Wednesday, then you need to take a look at the latest kfc Wednesday offers. Since you are at the mid of the week and you have to work for two more days with tons of work. The work which is piling up on your desk with deadlines can create a horrible situation for you. In this situation, you must be packed with your schedule and you want to have something which can liven up your day. At this particular moment, you have blessed with KFC Wednesday offers. You can check out for KFC menu and can order some crispy chicken wings and smoky grilled chicken and much more. With KFC Wednesday offers you can also save a huge amount while you order online. Since you deserve it so don’t miss it.